This is a subject that I touched on in this recent posting. "I don't think Maduro has the military. He has statements by his Minister of Defense who owes his job to Maduro. I think the average service member is very much on the side of Juan Guaido, the interim president. I think the military is still up in the air, I think the fact they have stayed in their barracks these last 30 hours now shows that they're not necessarily...that Maduro can't count on them to follow orders. So there are extensive discussions going on by members of the National Assembly with the military still very much in play and its one reason why today, here in Washington, we've been looking at ways to disconnect Maduro from the financial resources he needs to pay the military and otherwise keep himself in power. That could be a very effective way, we think, of helping the legitimate government." "We're looking at the oil assets, that's the single most important income stream that the government of Venezuela. We're looking at what to do to that. We want everybody to know that we're looking at all of this seriously. We don't want any American businesses or investors caught by surprise." "We're in conversation with major American companies now that are either in Venezuela or in the case of Citgo, here in the United States. I think we're trying to get to the same end result here. Venezuela is one of the three countries I called the Troika of Tyranny. It will make a big difference to the United States economically if we could have American oil companies really invest in and produce the oil capabilities in Venezuela. Be good for the people of Venezuela, be good for the people of the United States. We both have a lot at stake here making this come out the right way." I like that, the "right way" and how this American-driven upheaval will be "good for the people of Venezuela . Apparently, Mr. Bolton is not a student of history as you will see in this posting. "The copper nationalization, a major aspect of Dr. Allende's socialist program, contains the potential for serious conflict with United States financial interests and the United States Government if the take‐over is considered confiscatory by the companies. The copper investments amount to nearly $700‐million, and include large sums spent on the expansion of Chile's mines under the previous government of President Eduardo Frei Montalva, a Christian Democrat. 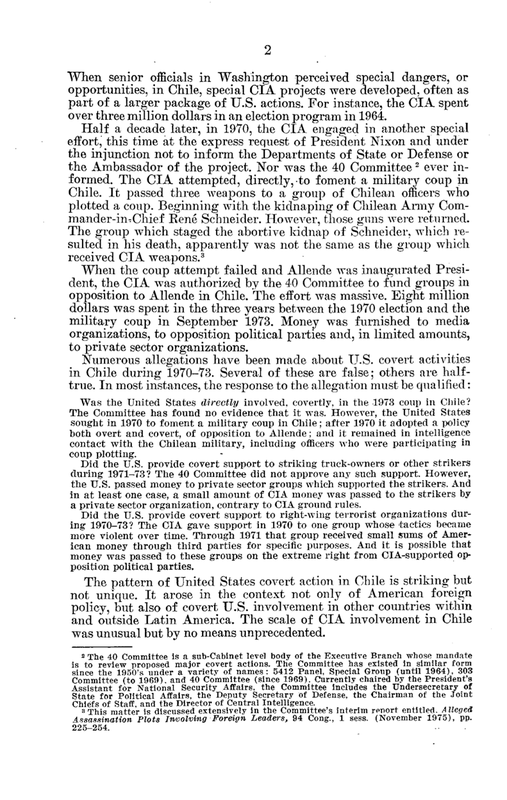 Mr. Frei promoted these investments through mixed United States‐Chilean companies in which the Chilean Government held a majority interest in most cases. The United States Government guaranteed the investments against expropriation through an insurance plan that provides a potential of about $350‐million in coverage. The nationalization that Dr. Allende wants will eliminate the 49 per cent interest of Kennecott and Anaconda in the big mines of El Teniente, Chuquicamata and El Salvador as well as. Anaconda's 75 per cent interest in the Exotica mine and Cerro's 70 per cent ownership of the Andina mine. These mines produce 90 per cent of Chile's copper exports yield sales approximating $750‐millions. Kennecott has been operating in copper here since 1908 and Anaconda since 1922. Cerro, newcomer, has just invested $130‐million in the Andina mine and made its first copper shipment this week. 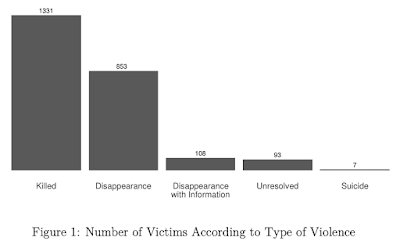 In addition, it is likely that at least 80,000 people in total were incarcerated and tens of thousands were tortured by the U.S.-backed regime. 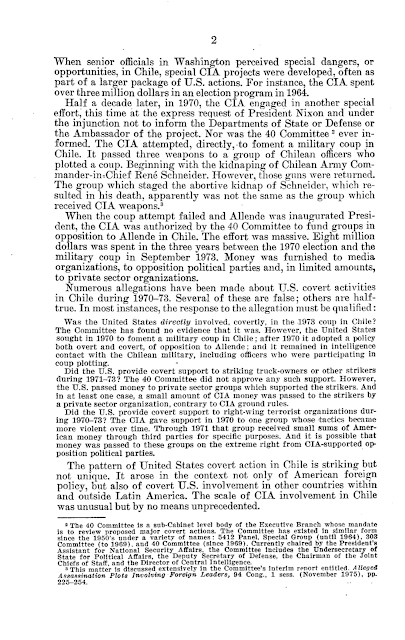 "The pattern of United States covert action in Chile is striking by not unique. 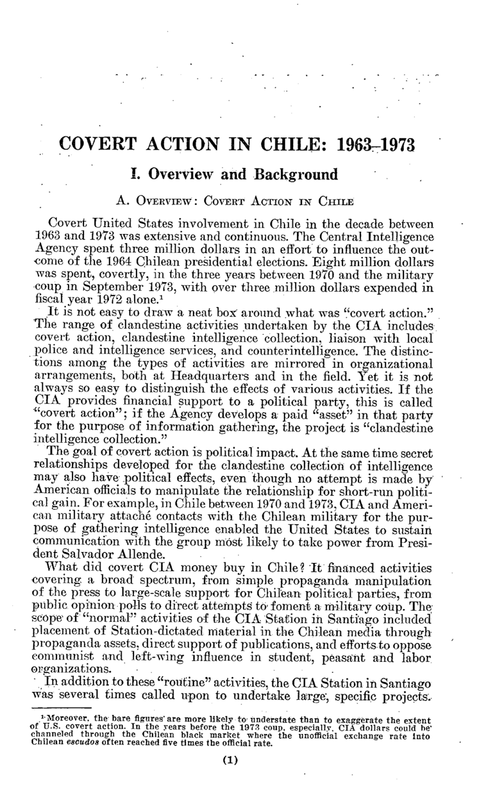 It arose in the context not only of American foreign policy, but also of covert U.S. involvement in other countries within and outside Latin America. 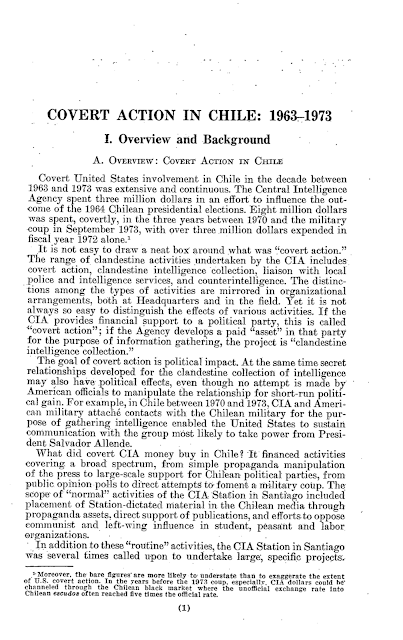 The scale of CIA involvement in Chile was unusual but by no means unprecedented." Apparently, John Bolton needs to read the Church Committee report. Augusto Pinochet remained in office until 1990 when he stepped down after a 1988 plebiscite saw 56 percent of the population vote against him remaining in office. He continued to serve as Commander-in-Chief of the Chilean Army until March 10, 1998 when he became a Senator-for-Life. On October 10, 1998, he was arrested in London in connection with human rights violations and tax evasion and embezzlement during his time in office. In October 2006, he was held on charges of torturing and kidnapping of his fellow Chileans with the Chilean government-appointed National Commission of Political Imprisonment and Torture reporting that more than 18,000 people were tortured during the four months after the September 1973 coup and 5,266 people being tortured over the period from January 1974 to August 1977. He died on December 10, 2006. "The Organization and its Members, in pursuit of the Purposes stated in Article 1, shall act in accordance with the following Principles. 2. All Members, in order to ensure to all of them the rights and benefits resulting from membership, shall fulfil in good faith the obligations assumed by them in accordance with the present Charter. 5. All Members shall give the United Nations every assistance in any action it takes in accordance with the present Charter, and shall refrain from giving assistance to any state against which the United Nations is taking preventive or enforcement action." "When nations respect each other, they can work together for prosperity and peace. Each of us here is an emissary of the own culture, history, values that make our homeland like nowhere else on earth. America chooses independence and cooperation over global government, each must pursue its own customs. 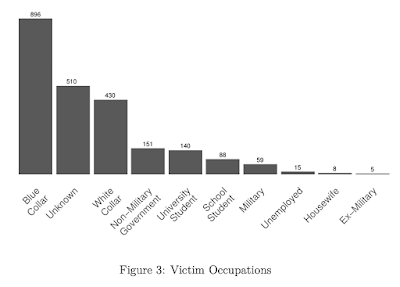 The U.S. won’t tell you how to live, work, or worship. We ask you to honor our sovereignty in return." While it's just a guess on my part but I suspect that there are hundreds of millions of people around the world who can see the irony in these comments. It is fascinating to see that the United States appears poised to repeat the mistakes that it made in 1970s Chile by replacing a democratically (albeit flawed) elected leader with their hand-chosen replacement. John Bolton's comments that the Venezuelan people will benefit from the American take-over of Venezuela's massive oil reserves rings hollow, in fact, the only people that will really benefit are the corner office dwellers in the American oil industry. Unless Mr. Bolton can guarantee that the Gauido government will not repeat the tragedy that was inflicted on Chileans by the American-backed Pinochet regime, Venezuelans will be the biggest losers in a new government that has been imposed on them by outside powers...all in the name of profiteering for Corporate America.